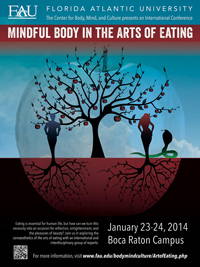 The Center for Body, Mind and Culture in Florida Atlantic University's Dorothy F. Schmidt College of Arts and Letters is hosting an international conference titled "Mindful Body in the Arts of Eating" from Thursday, Jan. 23 through Friday, Jan. 24 (9:30 a.m. to 5 p.m. each day) in the Arts and Humanities Building, 777 Glades Road, Boca Raton campus. "The Center is very pleased to organize this important international and transdisciplinary conference exploring the diverse aspects and cultural meanings of food," said Richard Shusterman, Ph.D., Dorothy F. Schmidt Eminent Scholar in the Humanities and Director of the Center for Body, Mind, and Culture. "The strong idealist tradition of our culture, one that largely dominates academic thinking, has tended to regard eating as essentially a base, animal activity that is negatively contrasted to the spiritual life of the mind. While eating is indeed a physiological need, knowing how to eat wisely and well is an art that requires intelligence, knowledge and imaginative creativity." A multitude of diverse factors affect our forms of eating and our choice of food: economic, medical, gustatory, ethical, social and aesthetic. The conference will address balancing these factors for a healthier, more gratifying art of eating. Conference presenters include distinguished scholars from Italy, Austria, Germany, Denmark, Poland, Finland, and Japan, as well as from American universities. Speakers will explore the arts of eating through research in disciplines that impact gastronomical theory (from health sciences and cooking to agriculture and economics) and those that concern the ways food practices are represented in literature, social theory, and the arts. This is the ninth international conference of the Center for Body, Mind, and Culture since its establishment in 2007. FAU's Center for Body, Mind and Culture has as its goal integrating scientific, humanistic and artistic research to promote ways that enrich somaesthetic understanding and thus improve the quality of life. There is no conference registration fee, however advanced registration is advised. To register, or for more information, visit www.fau.edu/bodymindculture/Conferences.php, or email bodymindculture@fau.edu.